The Phillie Phanatic will be here for Military Appreciation Night on June 14th. 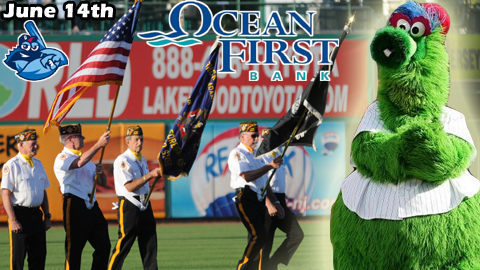 LAKEWOOD, NJ - The BlueClaws will host their annual Troop Supply Drive on Military Appreciation Night at their June 14th game (7:05), a night that also features an appearance by the Phillie Phanatic, thanks to OceanFirst Bank. Boxes will be set up for the Troop Supply Drive in the front of the ballpark and fans are encouraged to donate razors, snacks, baby wipes, shampoo, soap, non-chocolate candies and sweets, sun block with SPF 40+, lip balm, writing utensils, silly string, deodorant, tissues, q-tips, white socks, batteries, insect repellent, and flashlights. JERSEY AUCTION: The BlueClaws will be wearing camouflage jerseys. These will be auctioned off (silent auction) on the concourse during the game. This supply drive is in conjunction with the Monmouth-Ocean Central Labor Council Military Committee, Monmouth-Ocean Building Trade Council, National Guard, Toms River Armory, A.R.M.S, Troop Clothing Drive, and IBEW Local 400 Military Committee. Further, fans are also encouraged to bring gently used clothes to also be shipped to the Troops by A.R.M.S & JDK Wholesale. In addition, the BlueClaws encourage fans are also to bring items for the K9 Sgt. Denny Project, sponsored by the Dennis W. Zilinski Foundation. Sergeant Denny is a two year old German Shepherd stationed in Afghanistan and trained to detect explosives. His handler is a Monmouth County native. Suggested items include: tennis balls used as training rewards, one-ingredient treats (such as freeze dried liver), KongR toys, NylaboneR chews and toys, unscented shampoo with oatmeal added to prevent dry skin, collapsible water bowls, and leather leashes. "Military Appreciation Night here in Lakewood has been a great event these last seven years," said Pat O'Keefe of the IBEW Local 400 Military Committee. "It's great to see the local community come out and support the event and our Troops overseas." The BlueClaws will also be collecting, as always, gently used cell phones at the NJR Information Booth to benefit Cell Phones for Soldiers. There will also be a Black Hawk helicopter provided by the New Jersey Army National Guard. Fans are encouraged to go inside the helicopter and take pictures from 5 pm until the 7th inning stretch. In addition, the Phillie Phanatic will be making his first of two visits, thanks to OceanFirst Bank. The popular Phillies mascot will be entertaining fans throughout the game like only he can. He has been the Phillies mascot since 1978 and has been at FirstEnergy Park since the BlueClaws began play in 2001. Now the dean of all professional sports mascots, the Phanatic has entertained millions of fans all over the world. He has traveled to Japan, Australia, Mexico, Canada, Venezuela, and Puerto Rico and made numerous national television appearances appearances on shows like the "Today Show" and "Good Morning America." He has also starred in commercials on ESPN and the Fox Network. Finally, the night is a Thirsty Thursday, presented by 66MVP, with $1 beer and soda plus 50-cent wings from Ivy League Restaurant, in the Coors Light WRAT Trap. To order tickets to this or any BlueClaws game, call 732-901-7000 option 2 .